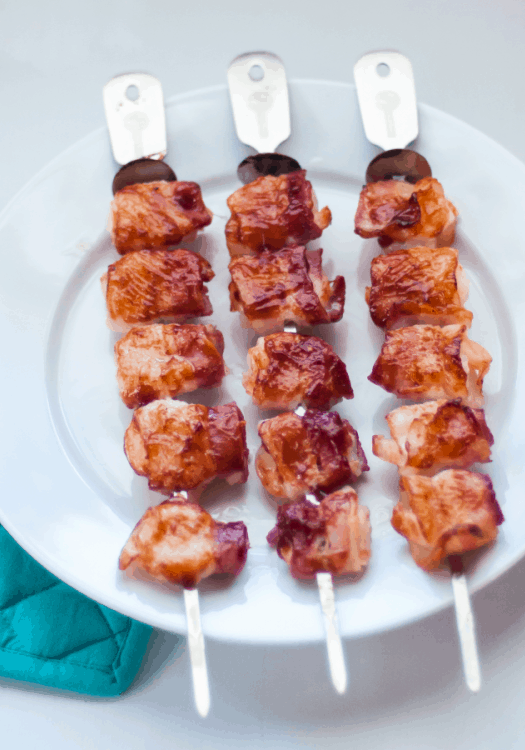 Bacon wrapped shrimp skewers are a delicious and easy appetizer (or main entree!) perfect for special occasions and entertaining. Only 3 ingredients, minimal prep time and tasty. You can’t beat that. Disclosure: Cave Tools provided a complimentary set of Shish Kabob Barbecue Skewers so I could share my thoughts with you. PS – I wouldn’t share if I wasn’t impressed. Hello! 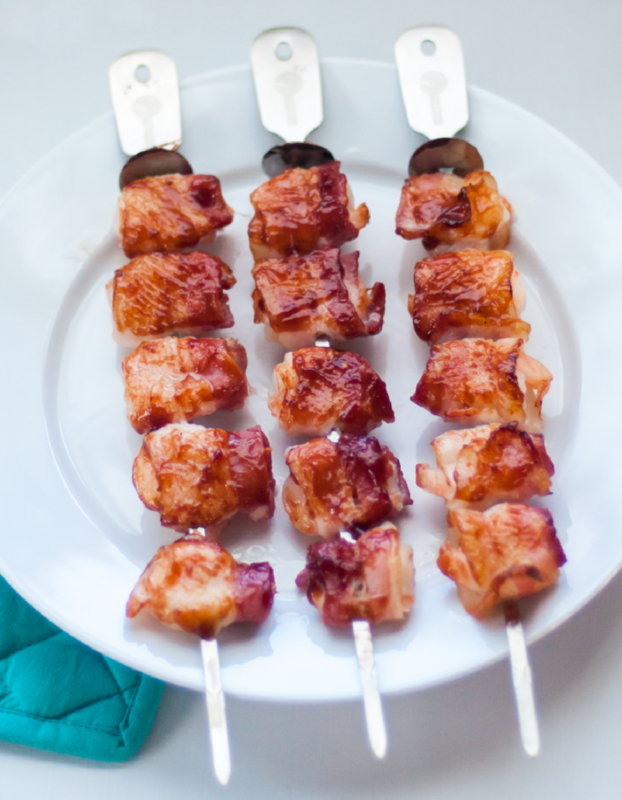 Today I’m sharing a simple recipe for barbecue bacon wrapped shrimp skewers. Which is a mouth full. Plenty of times I have accidentally referred to them as ‘shrimp wrapped bacon’ – now that would be a recipe to see. This recipe is a hit in our house because it covers both of my kiddos favorites. My 8-year-old daughter can’t get enough shrimp. And I don’t think I even tried shrimp until high school. This mama is not complaining. She also loves roasted broccoli. (Happy dance – haha.) And my three-year-old son is the pickiest eater, but happens to love bacon. So it’s a win-win. 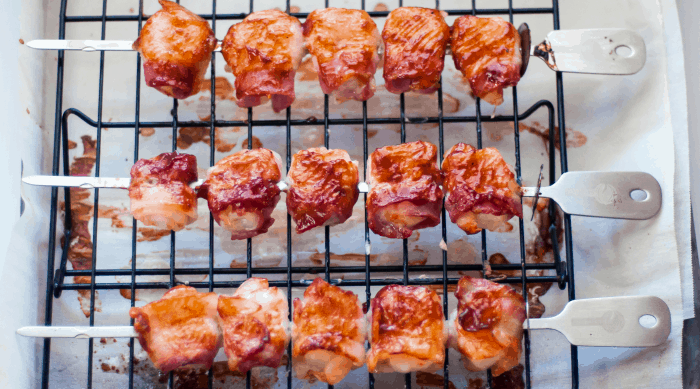 We made barbecue bacon wrapped shrimp a few times over the holidays. Once as the main entree served with plenty of dipping sauces alongside cheddar & chocolate fondue. So good! And we also made it on New Year’s Day. It’s the perfect main entree or appetizer to serve for special occasions. And it’s so easy to grab the ingredients. 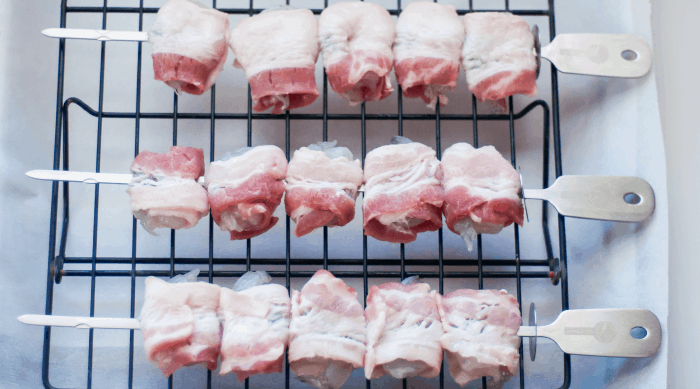 Before we get to the recipe, let’s talk skewers. The type of skewers I used is from Cave Tools. I requested to try them after I reviewed their Jalapeno Grill Rack last summer – you’ll have to check out the recipe and review. I’m impressed with the quality of their products. These skewers are stainless steel, dishwasher safe and easy to store. But the coolest feature is the food remover disc. (But be sure to let the skewers cool down for a few minutes before using it.) You can find Cave Tool’s Shish Kabob Barbecue Skewers here. 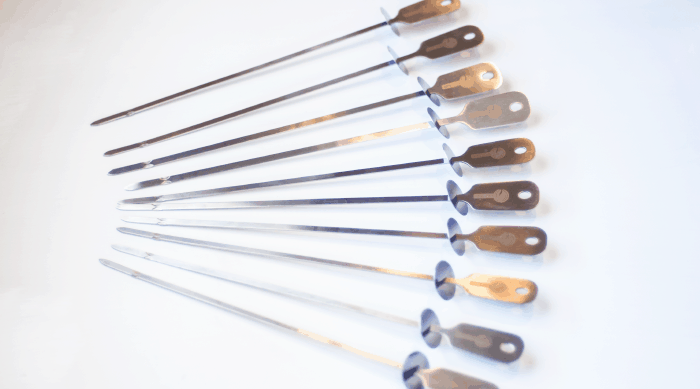 Use the promo code SKEWER15 to save 15% on the Cave Tools website only. Here’s what you’ll need for groceries. It’s so easy to grab these few ingredients, especially for a last minute get together. Although the shrimp can be spendy – it’s worth it. And here’s a list of supplies. I use parchment paper all the time for easy cleanup. Not necessary, but it definitely helps. Preheat the oven to 425 degrees. (If your oven has a convection setting, use it for added crispiness.) If you bought frozen shrimp, thaw it out by running it under cold water for several minutes. Prepare your pan by lining it with parchment paper. Again, it makes clean up so much easier! Place your baking rack on top of the parchment paper. You’ll want some type of rack to hold the bacon out of the grease. Otherwise, the bacon will be soggy. Not cool. Cut the bacon slices into thirds. Then wrap each piece of shrimp with 1/3 slice of bacon. Don’t overlap the bacon very much, just to be sure it gets done and crispy. Thread five pieces on each skewer. 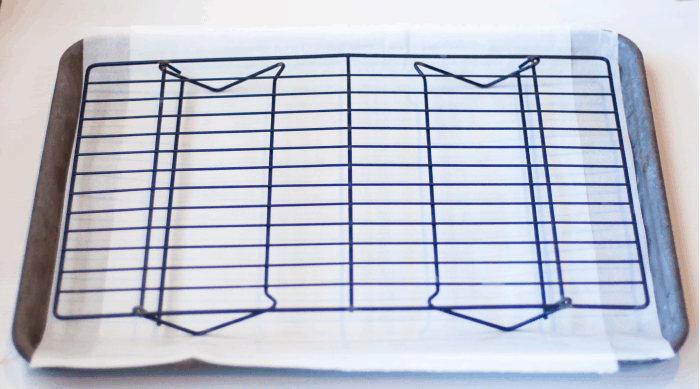 Line the baking rack with all of the prepared skewers. Roast in the oven for 10 minutes (15 minutes total – keep reading). 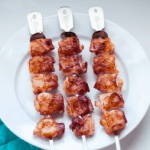 Then brush each skewer with barbecue sauce. You can use your favorite sauce or try our family’s easy barbecue sauce recipe at the bottom of this post. Flip and coat the other sides with barbecue sauce. Roast for another 5 minutes or until you reach desired doneness. Let them cool for just a few minutes. Then use the handy food remover disc & enjoy! They’re so good, I promise. And you can easily change the flavor with different barbecue sauces. Or let your guests choose and serve them with various dipping sauces. A delicious and easy appetizer (or main dish!) perfect for special occasions and entertaining. If shrimp is frozen, thaw out by running it under cold water. Prepare your pan by lining with parchment paper. Place your baking rack on top of the paper. Cut the bacon slices into thirds. Wrap each piece of shrimp with one third slice of bacon. Thread five pieces on each skewers. Line the baking rack with all of the prepared skewers. Roast in the oven for 10 minutes (15 minutes total – keep reading!). 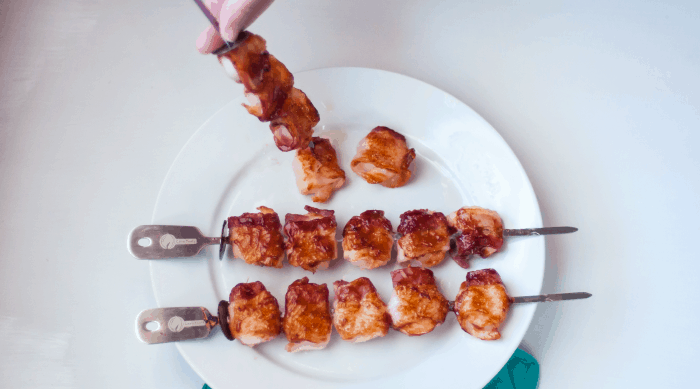 Brush each skewer with BBQ sauce. Flip and coat the other side with BBQ sauce. Roast for another 5 minutes or until you reach desired doneness.